If you are considering getting a more efficient heating and cooling system this summer, and want to save energy and money, both the ductless split system and the air source heat pump are great options. Not only can you save up to 50% on your heating costs (vs. electric baseboard or electric furnace heating), but now PSE Electric Customers who choose Fox for their ductless split or air source heat pump install can get the PSE Utility Rebates. Why is there a PSE Rebate Program? PSE (Puget Sound Energy) wants all of their residential customers to save energy. Heat pumps save energy, up to 50% vs. baseboard heat, and even more vs oil and propane heat. Therefore, Seattle customers are incented to encourage their installation. Plus it’s cheaper to pay these rebates than to build an additional power plant to satisfy our growing population. 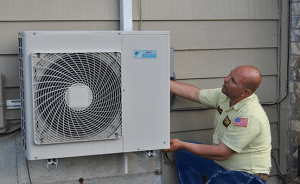 What is the PSE Heat Pump Rebate Program? Ductless Heat Pump Rebate: PSE is offering $800 to qualified single family homeowners who purchase a qualified installation through December 31, 2017. If you live in a manufactured home, they recognize that your electric use is often higher, and the rebate is up to $1200. There are several criteria that must be met and your Fox HVAC technician can explain them to you, plus provide options of equipment which will qualify. First, you must be a PSE Customer with an electrically heated home. And you must be using the ductless heat pump in your main living area. Air Source Heat Pump Rebate: PSE is offering a range of $350 - $1800 in rebates for qualifying air source heat pump installations. The difference in rebate will depend on the energy efficiency of the model, whether you are replacing an electric furnace, and/or using a lockout control mechanism. There are many variables and your Fox HVAC Specialist will review the options, qualifications, and rebates with you. How to Get My PSE Rebate? Once your installation is complete, you will submit the PSE rebate form directly to them with a copy of your Fox invoice. (The form is this fillable PDF on the PSE website). In the case of an air source heat pump, there will be an additional “sizing” document to send in which your Fox HVAC Specialist will provide. The rebate form is straightforward but we are here to help if you need it. Fox is a PSE Contractor Alliance Network member, and as such we guarantee the quality of your installation. Are you ready to get started saving money with a heat pump for heating and cooling? Talk to Fox and get an estimate from Fox’s HVAC technicians today.